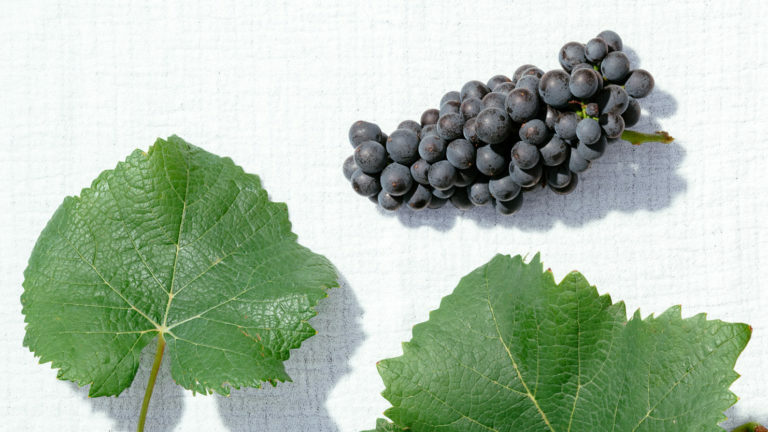 Pinot Noir is one of the most important grape varieties in the Thermenregion. The variety is a natural cross between Pinot Meunier and Traminer (Savagnin). 110 vineyard hectares are planted with Pinot Noir and make up 5 % of the Thermenregion’s vineyard area. After Freigut Thallern was bequeathed to the Cistercians in 1141, the monks introduced this variety from their homeland. This is how Burgundian varieties like Pinot Noir arrived in the Thermenregion and became native. Pinot Noir is planted throughout the entire region. Variations in aroma and style reflect the specific terroirs of where it is grown. Typical for Pinot Noir is the cylindrical shape of its grape bunches and its compact berry set. Grape berries are small and have a blackish blue colour and thin skin. Leaves have three to five lobes, are finely jagged, and have a slightly overlapping petiole. Budbreak occurs moderately early as does flowering. Ripening begins seven to ten days earlier than St. Laurent. The variety is relatively resistant to winter frost. Pinot has a tendency to adjust to its location and because it has existed for more than 2000 years, there are more than 1000 different mutations and clones found around the world. Due to its susceptibility to botrytis and chlorosis, Pinot Noir demands early and good sites. It prefers deep, warm soils with good water availability. The harvest begins between the end of September and beginning of October. Typical for Pinot Noir wine from the Thermenregion is red-berried fruit and a fine-boned structure. Aromas are exceptionally multi-layered. Red berries, cherries, wild strawberry orange zest and floral notes are characteristic – with maturity, notes of bitter almond may also appear.